Bonfire No, Doggies Yes, Camera Oh My! I usually have a holiday party on December 21, with a little solstice bonfire. I make the fire in my Weber grill to honor the city ordinance that fires be containable, and the flames still get impressively high. For six years, in rain and in snow, I've enjoyed this tradition, which I learned about from my Finnish friend Jaana (they have huge bonfires in Finland!). This year, unfortunately, my grill stood flameless: It was just too bitter cold and too freakin' windy for the fire to light and stay lit. I was a little bummed. Then today I got a Christmas card from my niece Sam that just made me smile out loud (um, you know what I mean). 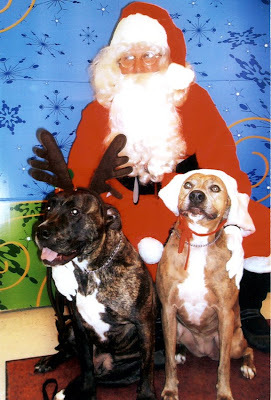 My granddogs‡ visited Santa Paws at their home in Colorado Springs! Koda is on the right, and she's looking quite pleased and proud in her Santa hat. The antlers really suit Xerxes; he looks so natural wearing them. And I love his tongue hanging out--it's a great touch. ("OK, Santa! I'm ready. Let's get the sleigh. Oh boy oh boy oh boy!") Even though I'm more of a cat person, I enjoyed taking the dogs to the dog park when I visited my niece in June. Koda liked to play fetch with the other dogs, and Xerx liked to wander around the edges of the park sniffing everything. They're both well-trained, lovable animals. Oh my. Heh heh. So, so much information in there. Mainly, there's a button that turns off the LED to save battery life (and verily my batteries have in fact lasted a lot longer since not using the LED preview!). This button is right next to the button you press to download photos to the computer. I must have accidentally pushed this button when downloading or when pulling the camera out of my pocket or purse. And not only that, but you wouldn't believe all the other nifty features my camera has, which I had no clue about: I can shoot movies (with sound!) and there are settings for panoramic views, portraits, and different conditions such as nighttime, snow, beach, indoors, and even underwater! I knew I could override some of its settings, like telling it not to use the flash, but it turns out there are a bunch more high-end manual features I can set too, like selecting the shutter speed and aperture values. I don't even know what that means, but it must be good! I'm so glad I didn't buy another camera yet because this one will suit me just fine. And instead of thinking of it as a klunky point-and-shoot, I now think of it as a very svelte higher-end camera. Problem solved. I wish you all a happy holiday season and a great new year. ‡ My friend Carole and Rose both enthusiastically talk both about their grandkids and granddogs, and if my niece had kids they would be my grand nieces and nephews, so I guess I can call her dogs granddogs, too! Hey, I talk to plants and I'm a cat lady. I'm not worried about what people think! ich wünsche dir ein Frohes Fest und alles gute für 2009. You have every right to call them your granddogs, Monica! They're adorable; we still have a photo on our fridge of one granddog with Santa taken a few years ago. Toby the cat had his taken at the same time. The local Humane Society does this as a fundraiser every year, but I missed it this year because of the bad weather--it was ridiculously cold and windy here, too. I laughed at your camera woes; I have been know to do many silly things with cameras. I think I even wrote a post about it last spring. You've inspired me to look at my manual again to see if I can do more than what I realized with it. Monica, Of course their grand dogs! Such a cute picture. Ich wuensche Dir auch ein frohes Fest! Speaking of stupid mistakes, I locked my keys int he car this morning because I was so freaked out about my furnace not working!! ARG!!! Fortunately, several friends of mine have keys to my house and are already off work, so I just have to wait until a more reasonable hour to phone them. I hate making mistakes, but I figure it may be humorous for others to read about!! Geez, those aren't dogs-more like reindeer! lol You have a Merry Christmas too! Happy Holidays Monica! Go ahead and claim the pups as your granddogs...pups need love too! I can't imagine the Coal the cat and Baby, the dog getting their photos taken and in hats! Thoose are well behaved pups your niece has raised. So glad your camera is fine! I wish I could find my manual...but my camera is really dying...and I want to make the jump to the next level! Take care, keep warm and have a great holiday! So glad you were able to figure out your camera Monica! I know mine has lots of features I haven't figured out yet. Hope you're enjoying the more moderate temperatures. I sure am! You can call those sweet pups whatever you want--I can tell they are happy as long as someone is giving them a nice scratch under the chin or better yet--a belly rub! So funny about your camera--sounds like something I would do--and have! So... in effect, you re-gifted yourself with the same camera! Way to go!! :-) Happy 2009, Monica.